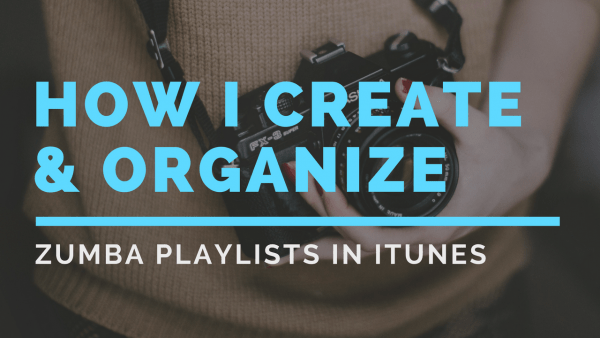 Recently I’ve been getting a lot of questions about how I organize Zumba playlists for all my different classes so I figured it would make a good topic for this week’s video. I know some instructors create a new playlist for every class they teach, but that’s too much for me. Keeping one playlist for each of my classes (Tuesday afternoon gets one, Tuesday evening, etc.) makes it easy when I want to change up the songs because I change them within that same playlist. From there, I organize my songs within the playlists to create intervals for higher intensity and lower intensity songs. I’ll be honest and say that I don’t always follow the Zumba structure as far as the song style list they give you when you become an instructor, but I do try to ensure a good variety of styles are dispersed throughout the class unless it is a special class (i.e. Reggaeton or Cumbia night or something). My method may not work for you, but I always feel like I learn a little something that I can apply when I watch videos or or learn from other instructors how they do things so I hope that rings true for you as well! Whether or not my method will work if you use other music managers I’m not sure, as I’ve always used iTunes, but if they have a visual way to rate individual songs it should work just fine.